As possibly one of the worst bloggers in Britain, I haven't really been to any events, meetups or made many blogger connections. I definitely wanted to change that when I moved to Newcastle though. There's such a great network of bloggers in the North East and I want to get to meet them all. Also, I wanted to meet a few of the bloggers who I actually HAD made a connection with. 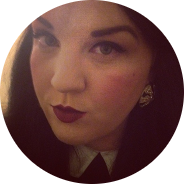 Back when I first started my blog I was much better at reading other blogs and generally attempting to get involved in the community, and so I made a few blog friends who I keep in contact with on twitter, and whose blogs you can visit by clicking on their banners in my sidebar. One of these lovely bloggers is Kirsty @ Indigo Buttons, and at the weekend, after ages trying to get it planned via twitter & text, she finally came to stay with me in Newcastle! I met her at the train station on Friday afternoon and I instantly adored her thanks to her genuinely huge smile and the Scottish way she says 'HALLO'. AMAZING. On Friday we didn't have anything planned and just ended up drinking (too much) wine in my flat, eating crisps and talking so much we barely paused for breath, (except when we put on a few Buffy dvds and both fell silent at the same time watching Jenny Calendar get murdered RIP). The next day we were a bit delicate (read MASSIVELY hungover) but headed out into the sunshine and into Newcastle city centre to eat and do a bit of shopping. 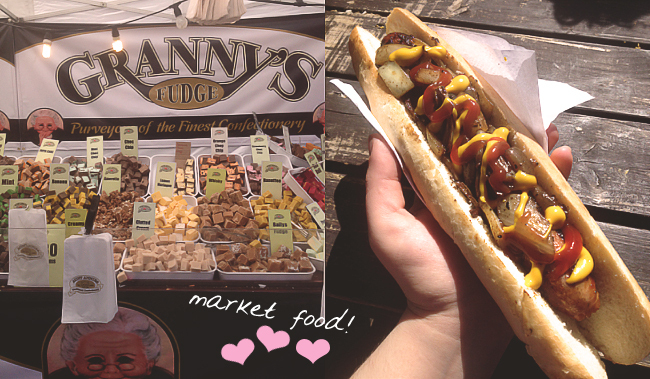 The continental market was on so it sorted out our need for hangover food. We dandered about in the sunshine & headed down to the quayside (one of my favourite areas of Newcastle) before heading back to get dressed, sort ourselves out (ie take painkillers and rehydrate) and head out for the evening. The following day I wanted to take her down Pink Lane to get Sunday lunch. The Forth & The Town Wall both do great grub on a Sunday but we went with The Town Wall. 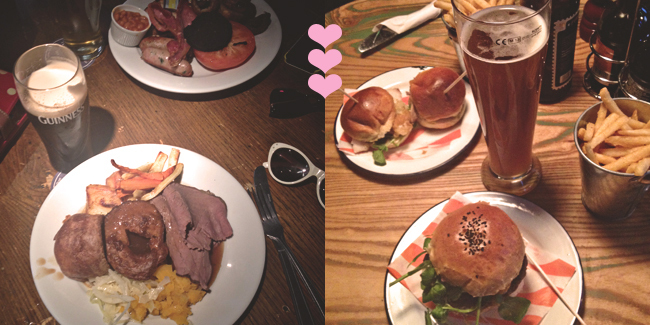 We got two massive armchairs to recline in and it was so lovely just chilling out chatting over food and a pint. We also may have completely lived up to our Celtic stereotypes as she got a fried breakfast and whiskey flavoured cider and I got meat and potatoes and a pint of Guinness. I do love a good Guinness to be fair. As the day progressed we went to 9 Bar for coffee (which I had heard great things about but was seriously underwhelmed with- the service was so flat and the place looked kind of grubby), the Tyneside Cinema, (a proper Newcastle gem), dAt bAr for MORE pints and burgers (seriously amazing from the service to the drink to the food- my burger was UNREAL and I can't stop thinking about their homemade catsup) and finally ended up in The Free Trade Inn which is, in my opinion the BEST pub in Newcastle and has an amazing view of the Quayside that I am completely obsessed with. Love the place. I will admit that before meeting her I was super nervous about the weekend. I'd never met a blogger friend before, let alone someone I had only ever chatted with online so I was worried that the rapport we had via the Internet wouldn't translate to 'real life' and things might be awkward, but I needn't have worried. I genuinely had such an amazing weekend with Kirsty- she's such a lovely, funny, warm person who makes you feel at ease even when she's showing you her 'creepy eyes face' from her days as a tour guide (IT'S AMAZING), and I had an ace time showing her round the city that is my adopted home (she even got the authentic 'smackhead going off on one on the bus' Geordie experience). 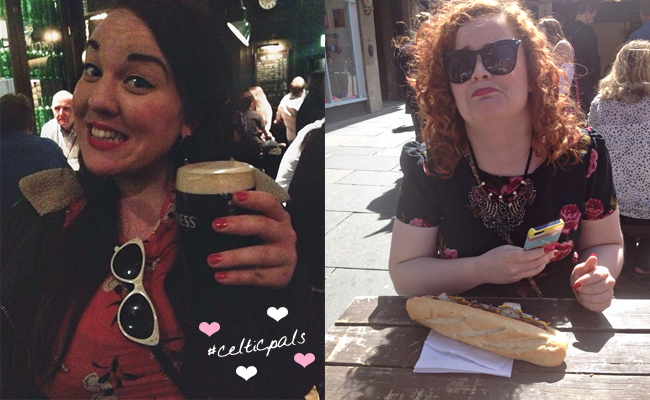 I've definitely made a great wee pal in her and cannot wait to have her down again/visit her in Edinburgh! 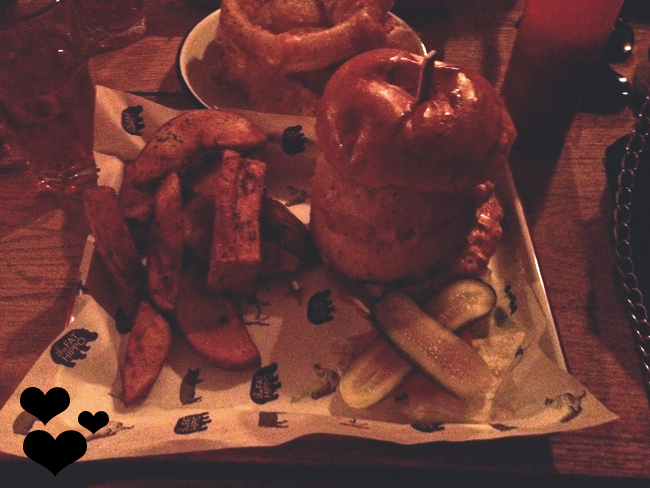 If you want to, head on over to Kirsty's blog to check out her post about her Newcastle weekend here! Congratulations to you! You've won the grand prize, including one of Air Wick's brand new premium Home Signature reed diffusers in Velvet & White Orchid, a copy of 'How to be a Domestic Goddess' by my personal life goddess Nigella Lawson, Soap & Glory goodies and a cute owl cuff from Accessorize! I loved Anna's story about her memories of university coming back to her whenever she smells biscuits! Congratulations to the both of you, your prizes should be with you shortly! Anyone who knows me knows I am a bit of a sucker for nice smelling things for my home. I have no will power when it comes to candles, incense & fragrance oils- I spend far too much money on them. I think that a nicely fragranced home is so important though. It makes a space cosy and relaxing, and it's welcoming to others who are visiting. 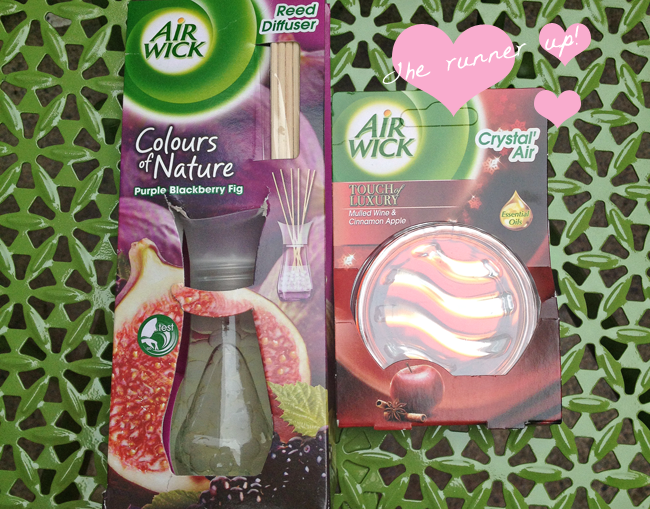 So I was pretty excited when Air Wick got in touch to see if I wanted to play with a couple of their products. 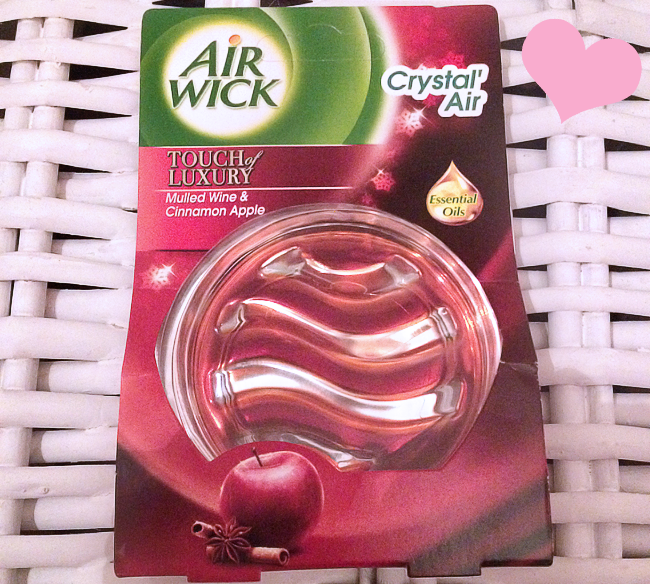 I've used Air Wick products before, (in particular, their scented Christmas candle!) so I was interested in trying something new that I hadn't used before. They suggested I try a reed diffuser, something I haven't had much luck with in the past (I can never find one that smells strong enough) so I agreed to give it a go. I have to say, I am quite impressed with how well the scent fills my living room. I have quite high ceilings too, and the diffuser is currently on the other side of the room from me and I can smell it as I sit here! It's not in anyway overpowering or cloying either, just a nice background fragrance. This particular fragrance is lovely too- sweet, fruity and warm. It reminds me of something from my chilldhood too- I can't put my finger on it but I keep thinking about a caravan holiday to Galway we had as a family when I was little! That's another reason I love fragrances, they can be such a powerful memory trigger. Honestly though, I do think the diffuser itself is pretty ugly. I guess you can't really expect too much from something that is mass-produced and intentionally meant to be affordable (the diffuser costs about £7 in the shops which is pretty reasonable), but I have seen similarly priced products that look much nicer. I would buy it again though I have to say- & I want to try the White Vanilla Bean fragrance next, however, I will probably try to find a nicer bottle to decant it into. 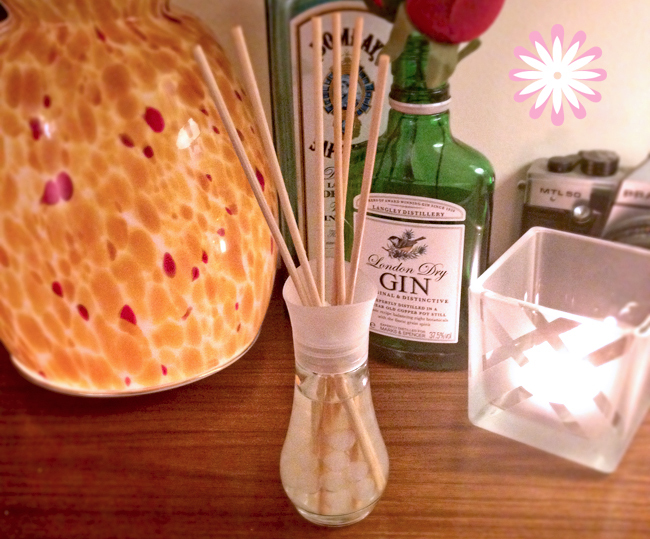 They also very kindly sent me out an aroma diffuser to try as well- a mulled wine & cinnamon apple fragrance. Slightly out of season, ahem, but it smells so delicious that I really don't care. The only downside is that it makes me hungry and maybe a tiny bit excited for Christmas, (confession: this is not the first time this month I have had a little twinge of excitement for Christmas. I know, I know I have a sickness). Again, this is really well scented- in fact I have had to put both products on either side of the house so they don't compete with one another but on the plus side my house smells amazing ALL OVER. 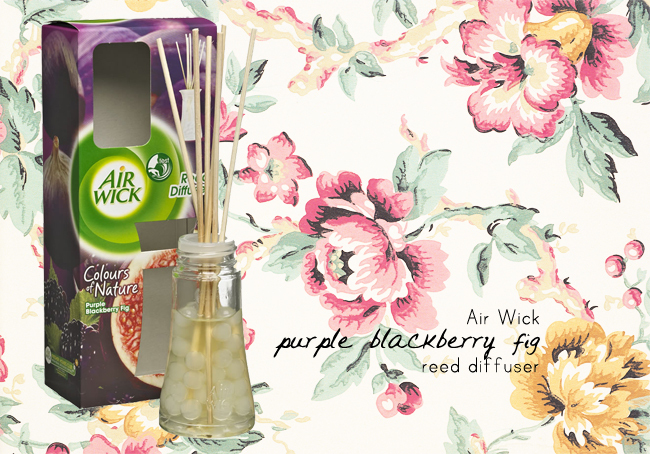 Now for the exciting part: Air Wick have kindly offered to give away one of the reed diffusers to a lucky reader! 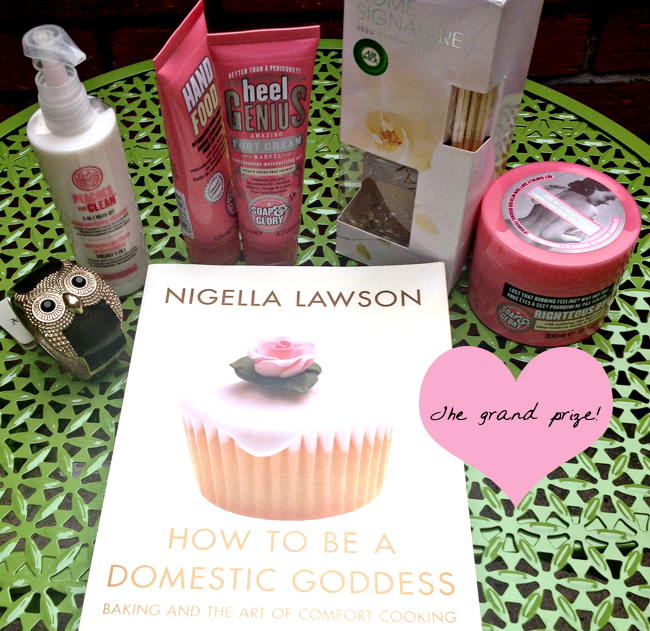 Along with this, I'll also be sending the winner a few other gifts: a beautiful Accessorize owl cuff, some Soap & Glory goodies and a copy of Nigella's 'How to be a Domestic Goddess'! In order to enter this giveaway just enter the Rafflecopter below! All you have to do to enter is leave me a blog comment telling me about your favourite scent-triggered memory! It could be a perfume of a loved one, your favourite food or the smell of the ocean! For extra points you can also tweet out a link to this post from the rafflecopter below- but it's not essential. And that's it! The competition is open from now until 9AM on the 14th May! I'll announce the winner here on the blog & I'll be sending the prize out shortly after that. Good luck everyone!